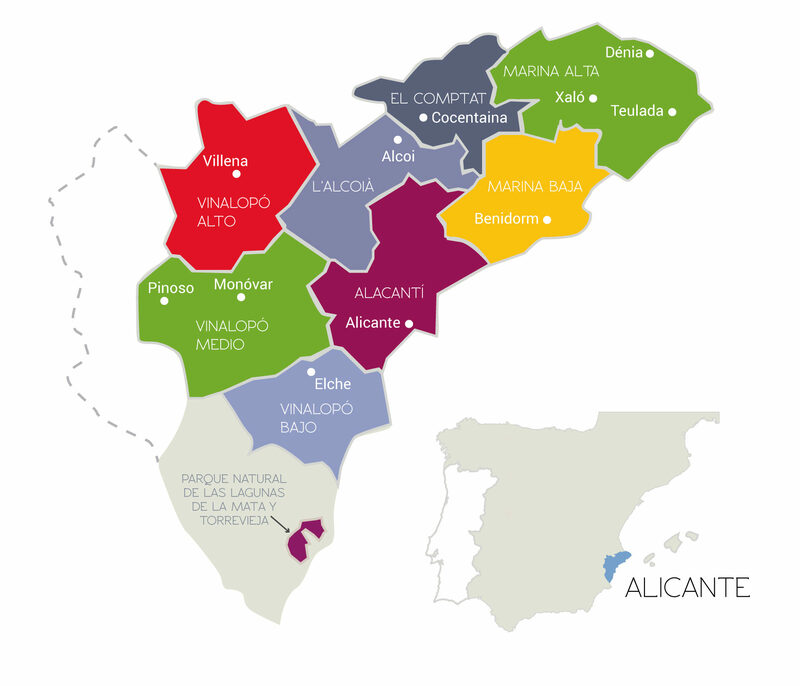 The Alicante PDO is divided into subareas, the natural regions of Alicante province and its surroundings. The origin of the Alicante PDO lies in the city itself and its northern Huerta region (Cabo de las Huertas and traditional dryland crop areas of San Joan, Mutxamel, San Vicente, etc. that were included in the municipal district). These crops have now disappeared from the area except in a small extension of land around Finca San Gregorio and Morote. But the protected towers, old wine cellar buildings, and hundreds of engravings and references to this important crop remain, as well as family-run wineries. This is the area between Novelda and Pinoso to the south, Agost to the north and Elda to the west. Today it is the main production area in spots such as El Mañán, Algueña, or Pinoso, with the largest number of wineries. Land heights are average (between 200 and 500 m above sea level) although some crops can be found in the Sierra del Cid mountains (1,100 m). The climate is dry with the maritime influence of Mediterranean winds. This area also includes the specific landscapes of Abanilla, Jumilla and Yecla, in Murcia. They are a natural part of this region and have always supplied grapes to the local wineries. They have been included in the Alicante PDO for legal reasons, as this protection seal is prior to the DOs of the neighbouring region of Murcia. The attachment shows these specific landscapes protected under our seal. Covering Sax to the east, the extensive municipal district of Villena (which borders with Murcia, Castile-La Mancha and Valencia) and, to the north, from the source of the Vinalopó river to Banyeres de Mariola. Land in here is higher, with heights such as the Sierra de Salinas mountains (1,238 m). The climate is more extreme in this case, with colder winters, and it combines irrigation with dryland crops. The fertile lands of Elche and surrounding areas have boasted vineyards for centuries, and can still be found in the Matola region, controlled by one winery. Characterised by its low lands and proximity to the sea, these meadowlands are influenced by the easterly winds that blow towards the Sierra de Crevillente mountains. This region is a natural valley (Foiá de Castalla), set among the high mountain ranges such as Maigmó (1,296 m), Aitana massif (1,558 m) and Sierra de Mariola (1,220 m). These mountains shelter a land of typical Mediterranean limestone, great temperature variations and wide-ranging heights. The vines grow in the centre of the valley and at medium height, although in recent years they have suffered significant deterioration. Further north, in this region we can find rivers that channel water from the mountains towards the Serpis river, which runs to the sea towards the north of the province. The climate has more rain and cooler temperatures in summer, but more intense winters. Dryland crops have been recovered on the lands standing over 600 m above sea level. This subregion is known for its sea influence and greater rainfall, which means crops must grow on dry land and terraces as it boasts a wide range of mountains and valleys (most notably: Peñón de Ifach or Montgó). The climate is mild all year round, with less contrast, making it more placid. Today vineyards can be found in the sea-facing areas of Teulada-Moraira-Benissa. And inland, where the Valle del Pop valley is the main area with wines growing uphill to Bernia (1,128m.) and inland, in Castell de Castells. The region is known for towns such as Benidorm, La Vila or Altea, standing opposite the sea. But its vineyards lie inland, for example in the Valle del Guadalest valley, almost 600 m above sea level. The climate is dry, with higher temperatures than the neighbouring Marina Alta. The Alicante PDO allows us to identify towns and landscapes by their wines, and nowadays works towards making information on the specific origin of each wine more transparent and accurate.